Welcome to another edition of beauty crave-a weekly series that showcases products that are currently on my beauty wish list. 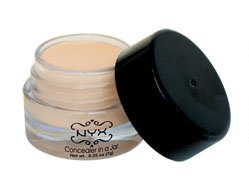 In this post, I will be featuring a makeup company who is much loved and raved about-NYX Cosmetics. I don't own many NYX products, but what I do have, I love and am not disappointed. I am a huge fan of their eye shadows as well as their famous Jumbo eyeshadow pencils-they make great eyeshadow bases. Since I have just discovered the greatness that is cream blush, I want to try all the cream blushes that are out there! 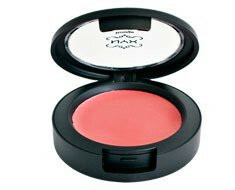 This NYX cream blush looks very creamy and there are lots of fun colors to choose from. How fun do these glitter liners look? I am so loving the green, and blue. I am sure these will add fun to any eyeshadow look in a snap! I have been in a never-ending battle when it comes to trying to conceal these dark circles of mines (they have made it very clear that they are not going anywhere! Ugh). I wonder if this concealer will help conceal and tame them down. I love how the concealer comes in many shades, as well as having color correcting shades as well such as yellow, green, and now orange! I am curious about the orange shade as I have read that orange is a good color to help conceal dark circles. I love the how there are so many shades available of NYX nail polishes-150! There are many different polishes finishes to choose from such as cremes, some frost, and I think I see some glitters as well. I have read many raves about this new NYX eyeshadow base. This comes in 3 shades-white, which helps eyeshadow colors pop out even more while appearing more vibrant, pearl, which is used to make eyeshadow have a more pearled iridescent look to it-I am guessing that this gives shadows a frost/sheen look to them. Lastly, this base is available in skin tone, which is your basic skin-tone colored base that helps shadows last longer. 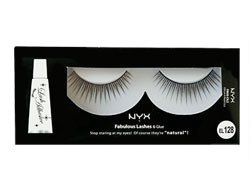 I am still a false-eyelashes newbie, but how fun are these awesome looking lashes? They are available in such a huge variety of styles and lengths that would surely spice up your eye look weather you are going for a neutral daytime look, or a smokey dark look for a night out. 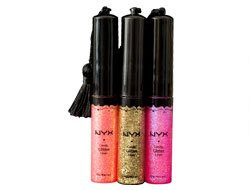 Have any of you tried any of these products by NYX? 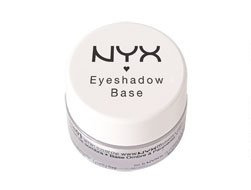 What are your favorite NYX products? Let me know in the comments section, I would love to hear your thoughts. Disclaimer: I am not affiliated with the company mentioned above. I have the a few NYX cream blushes. I like them! I can swatch them on my blog if you'd find it helpful..
@ Sofia- LOL! Nice :) I hope you make a little haul post, I would love to see the NYX goodies you picked out! @ Onjel- Cream blushes are my new favorite! Swatches would be amazing, and very helpful. Thank You!